Jon Stewart returns to television to tear into Donald Trump's executive orders. Former Daily Show host and current retired person Jon Stewart joined Stephen Colbert on The Late Show to roast President Trump like only he can. 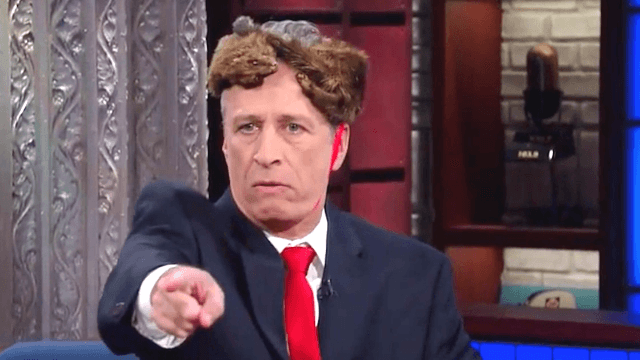 Stewart surprised the audience by showing up in a (very, very) long red tie and a dead animal fixed to his head—clearly a nod to our commander-in-chief—and read Trump's next batch of hypothetical executive orders. Donald Trump has already issued 20 executive orders in the first 10 days of his presidency, but Jon Stewart predicts that he isn't done yet. He theorizes that some of the next executive orders will include borrowing China's wall and putting it on the American/Mexican border as well as making the official language of United States "bullsh*t." Trump is fluent, after all. Stewart ends the segment with a powerful message, remaining quasi-in character as he spoke directly into camera. We have never faced this before: purposeful, vindictive chaos. But perhaps therein lies the saving grace of my, Donald J. Trump’s, presidency. No one action will be adequate. All actions will be necessary. And if we do not allow Donald Trump to exhaust our fight and somehow come through this presidency calamity-less, and constitutionally, partially intact, then I, Donald J. Trump, will have demonstrated the greatness of America — just not the way I thought I was gonna.